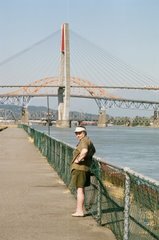 Nature notes and photos from BC, Canada, mostly in the Lower Fraser Valley, Bella Coola, and Vancouver Island. 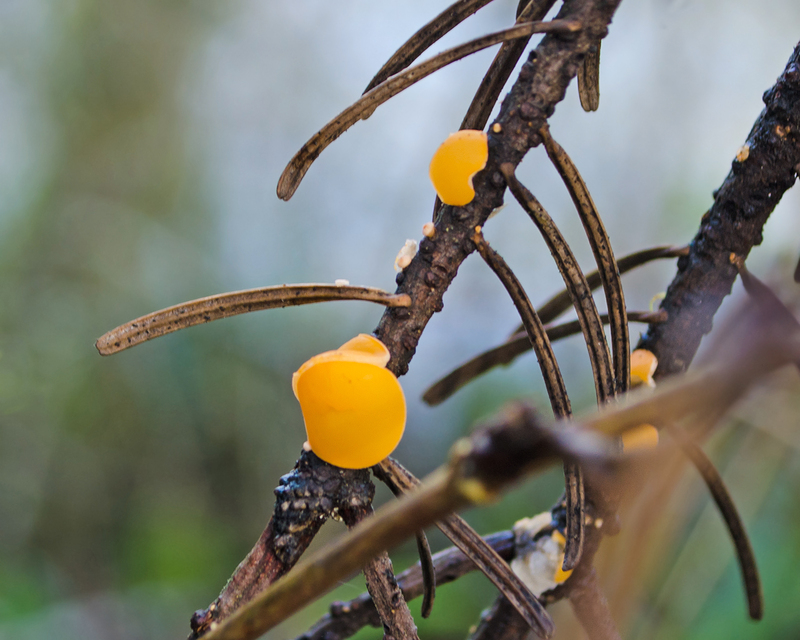 Orange discs, 3 - 5 mm across, on fallen conifer branch. Among hundreds of photos of orange and yellow blobs, plates, cups, discs, the ones that looked most like these were the Yellow Fairy Cups, Bisporella citrina. Except that the guide book, and Wikipedia, and E-Flora all said that they grow on hardwoods, deciduous trees. And this branch is definitely a conifer. Small, slightly concave discs, bright orange, paler on the underside. There seems to be hints of a bit of stalk. I looked again, read descriptions of anything that looked remotely similar, and came back to Yellow Fairy Cups. And found a few references to them on conifers. 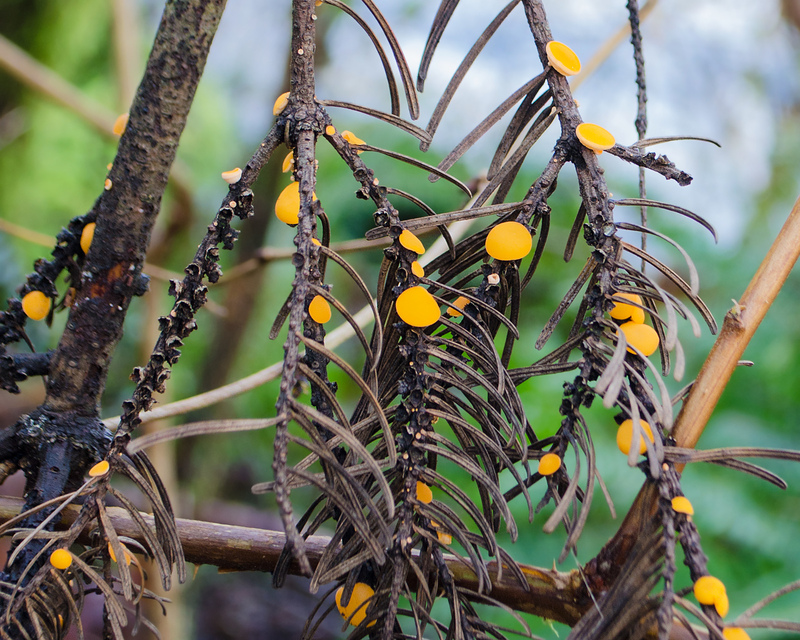 E-Flora says they grow on dead hardwood, but they have one photo taken in a conifer forest. MushroomExpert.com says they're on hardwood and conifers. Central Coast Biodiversity puts them on both hardwood and conifers. Except: nothing about fungi is ever easy. They are supposed to grow on rotting logs and stumps, not twigs. Maybe nobody told them. Or maybe they're something else altogether. However, the search was not useless. I learned a new word. Erumpent. bursting forth or through a surface. "perithecia separately or collectively erumpent"
A better, more accurate word for the way fungi emerge from the wood they live in. And a reminder that these small or large "shrooms" and conks are just the fruiting bodies pushing their way out into the open, but only a small part of a large organism, sometimes spreading through a whole tree or even a whole forest. If your comment is on a post older than a week, it will be held for moderation. Sorry about that, but spammers seem to love old posts! Also, I have word verification on, because I found out that not only do I get spam without it, but it gets passed on to anyone commenting in that thread. Not cool! Visiting Runswick Bay at half term 2019? why I love it here.